Does this look familiar to you? Did you think like I did when I first moved to Robson Ranch that the Agave at our rental needed water? I found that the dying leaves smelled terrible and looked rotted when I pulled some of them out. Shortly after this occurred, I found out about the landscape classes offered at the U of A Cooperative Extension in Casa Grande. I knew nothing about desert gardening and thought this would be a good way to learn. When we got to the class about Entomology, I realized what the problem was, and it wasn’t water. It was the Agave Snout Weevil. The weevil is black and about an inch long with a long snout. The adult weevil does not have wings and moves from plant to plant by walking. The adult chews into the leaves and introduces a bacterial rot, which is necessary for the development of the larvae. The adult then lays eggs in the holes, and the subsequent larvae burrow into the plant. By the time you observe the wilting leaves the bacteria has done its job and the plant is beyond help. You have no choice but to remove the plant. It is also recommended to remove the larvae and adults from the soil around where the plant was located. 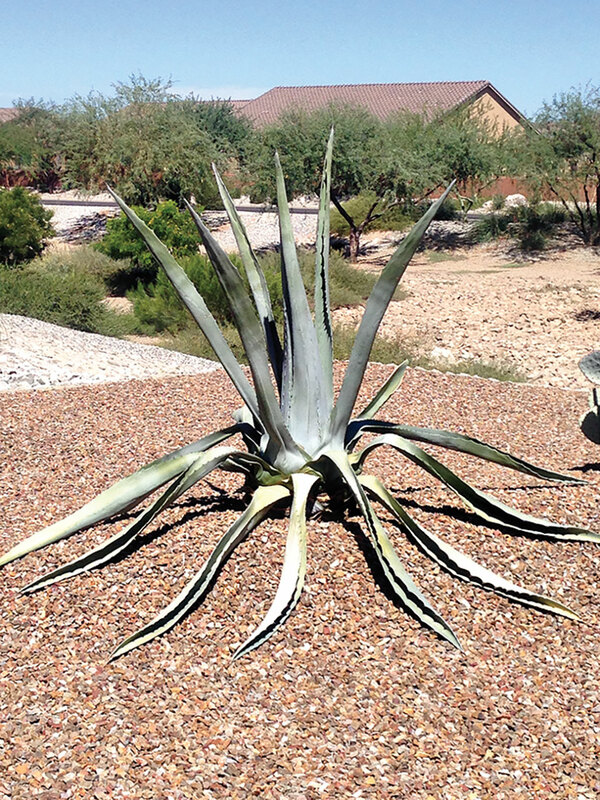 Do not replant another Agave in the same area. Prevention: Use a liquid insecticide every two weeks during the months of May through July. I have been successful using Triazicide. Apply the liquid to the base of the leaves to kill the adult Weevils and use the granules on the soil beneath the plant for the larvae. So far I have had no problems.